One of the services I want to provide is the ability to record longer form 360/VR video. Six independent GoPros with internal only batteries gives me a record time of just over an hour before needing to recharge them. Makes it hard to sit them there for a two hour concert doesn’t it! I found some great USB power packs that work great! IXCC Power Bank 20000mAh. Two USB ports handle two cameras. My 3D printed battery holder mount holds the batteries to power the cameras all day if necessary. I use three power packs to handle all six–I can run the GoPros for most of a day with this setup. Next thing I wanted was easy mounting and portability. They need something to mount to, preferably in the nadir viewpoint of the cameras, which I would be normally masking out during post anyway. So I designed a holder that mounts underneath. Putting my 3D printer to work for 25 hours, and I have a nice one-piece battery holder. This is much more elegant than taping the batteries to the tripod. Incidentally, by “tripod” I mean that I use either a mic stand, or standard production light stand. 360 cameras don’t normally need to be on a pan/tilt tripod. 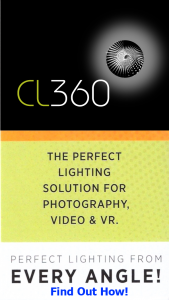 This battery mount also works well with my CL360: my Patent Pending 360/VR production lighting instrument. Click on the link to find out more about that. Now I’m ready to produce 360 Video/VR content! Contact me for details in the Philadelphia region. Battery mount also works with my patent pending lighting system.